Science is interesting, but sometimes it may be weird as well. The following article has some weird scientific discoveries listed for you which are bound to leave you amazed.Science need not always be interesting, sometimes it can be weird as well. You must have come across quite a few weird science facts like a single cup of coffee has over a thousand chemicals in it or something like the tongue of a blue whale is as heavy as an adult elephant. Well such weird facts exist in plenty, but have you ever come across some discovery which can be termed weird? Yes, there do exist weird scientific discoveries. These discoveries may not earn the people associated with them the Nobel Prize or any other prestigious award for science, but they do earn them recognition, and of course make you laugh. 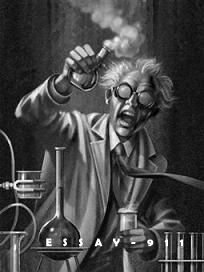 Even though these strange scientific discoveries may not be of any importance to you, you should still go through them as they do guarantee some laughter and an element of surprise. Given below is a list of weird scientific discoveries from all over the world, which are bound to bring out all the possible emotions from within you. Love and Obsessive-compulsive Disorder are Same! Donatella Marazziti, Alessandra Rossi, Giovanni B. Cassano and Hagop S. Akiskal discovered that romantic love and severe obsessive-compulsive disorder are biochemically similar. Their research revealed that the psychological dimensions shared by both of these conditions demonstrated common neurochemical changes involving the 5-HT system. In 2006, Simon Rietveld and Ilja van Beest - both hailing from Netherlands, discovered that various symptoms of asthma can be cured by resorting to a roller coaster ride. Their study revealed that positive emotional stress which one experiences during the roller coaster ride tends to interfere with dyspnea (difficulty in respiration) perception and eases this symptom. In 1990s, Carl J. Charnetski, Francis X. Brennan, Jr., and James F. Harrison discovered that listening to muzak i.e. recorded background music played in public places, tends to stimulate the human immune system and thus helps in prevention of common cold. They discovered this in course of their investigation of the effects of music and auditory stimulus on immunoglobulin A (IgA) in the human body. In 2000, the trio of Marie-Christine Cadiergues, Christel Joubert, and Michel Franc discovered that dog fleas jump higher than cat fleas. The study involved calculation of mean height jump of 50 percent of the flea specimen. The highest jump by a dog flea was recorded to be 25 cm, while the same by a cat flea was recorded to be 17 cm. In 2001, Jack Van Impe and Rexella Van Impe discovered that black holes in the Universe technically qualify for the location of hell on the basis of description of hell given in various religious texts. A renowned televangelist, Jack Van Impe is nicknamed the walking Bible owing to his thorough knowledge about the verses mentioned in this holy book. In 1994, Eliyahu Rips along with Doron Witztum and Yoav Rosenberg discovered some encoded messages in the Book of Genesis - a part of the Bible. Their claim of discovering these encoded messages, which were in the Hebrew text, was eventually mentioned in the book The Bible Code by journalist Michael Drosnin. In 2007, evolutionary psychologist Geoffrey Miller, along with Joshua Tybur and Brent Jordan, discovered that lap dancers made more money when they are at the peak of their fertility period. Their discovery was made public in an interdisciplinary journal titled the Evolution and Human Behavior. Weird Scientific Discoveries 8 of 10 on the basis of 1667 Review.